There are only a few lucky species of animals that experience the hormonal scrapple that comes with menopause. Humans, for example, experience menopause so that mothers-in-law don't spew too much vitriol on the temptresses that have bewitched their baby boys. And to conserve resources or whatever. Killer whales, on the other hand, most likely experience menopause just so that doting mother whales can make their good-for-nothing, live-in, 30-something sons' lives as easy as possible, since, you know, whales don't have hands with which to pick up dirty underwear or make pastrami sandwiches. 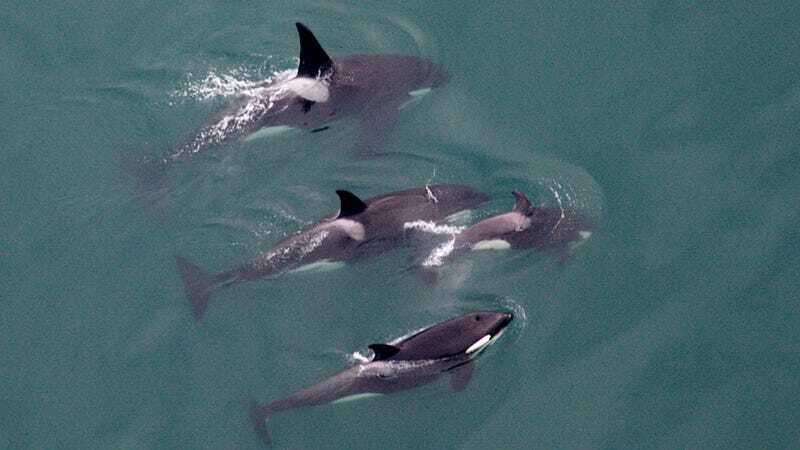 According to the most erudite and articulate researchers, male killer whales are "mama's boys." That's right — it's just a whole ocean of Robert Barones floating around next to their moms, wailing things like, "Maaaaaaaaaa, I'm hungry" which to entranced and unsuspecting humans sound like the lyrical thalassic language of mermaids. Male killer whales, as it happens, have serious trouble surviving on their own. This, explains Dan Franks from the University of York, is the reason female killer whales "have evolved the longest post-reproductive lifespan of any non-human animal." Female killer whales quit making little whales at about age 40, but they can live to upwards of 90, more or less the same as people. Franks and his fellow researchers found that having a menopausal mother floating through the seas right beside them increased dramatically increased their chances of survival. A male over age 30 was 14 times more likely to die without his mother than with her. Meanwhile, young lady whales seem to be able to manage much better on their own — a motherless existence only increased their chances of death about threefold (daughters under 30 were hardly affected by the loss of mother whale). Doting mom whales are mainly self-interested — they want to spread their genes to as many baby whales as possible, but, speculate scientists, they don't want to share limited resources. Male and female whales both stay with their moms in a single group forevsies, but when sons mate, their offspring are cared for by females in another group, while daughters' offspring remain in their mother's original group, gobbling up all the precious water and elephant seals. Menopausal killer whales, then, have a greater interest in ensuring the survival of their male offspring because, on the whole, all they want is a quiet basement to bring their girlfriends back to and maybe a Sega Genesis.